When I first told The Pit that I might like to make Cashew Chicken for dinner, he was oddly unenthusiastic. Here I was suggesting something new, with an Asian flavor no less, and he was muttering about how he wasn’t fond of cashews. News flash Pit: me wanting to make something Asianish happens…oh, maybe never again. Grab this opportunity with both hands and do not let go! Anyway, I overcame his cashew objections by telling him he could eat around the nuts, and made a somewhat modified version of this Simply Recipes dish about a month ago. 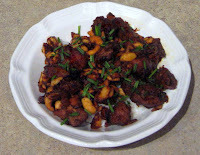 Despite my marinating the chicken for much too long, The Pit loved it, cashews and all. He’s been asking me to make it again, and earlier this week I think I got the recipe just right. 1) First, marinate the chicken. Cut the chicken breasts into 1-inch cubes, place in a gallon size plastic bag, and mix with the vegetable oil, soy sauce, honey, and chili powder. 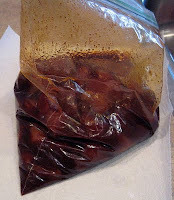 Squeeze the bag and make sure the marinade ingredients get well mixed and cover all the chicken pieces. Double bag if, like me, you manage to drop raw chicken pieces all over the outside of the initial bag, and then leave in the fridge for ½ to 2 hours. My mistake with the dish the first time I made it was leaving the chicken to marinate overnight. This resulted in an extremely appetizing aroma, but a taste so intense that mixing in 2-3 times the normal amount of rice barely diluted it. This time I left the chicken to marinate for about 2 hours, and the flavors were much more balanced. Shorter marinating times might be okay, but I wouldn't actually leave it for much longer than this. 2) Start your rice cooking about 20 minutes before the marinating period is up. Remember to turn off the heat at the appropriate time, but leave the rice covered and warm while the rest of the dish is cooked. 3) Dice the onions. You’ll probably still have time left on the marinating, and can use it to make some sort of quick accompanying salad. I’ve made this cucumber salad and this coleslaw. The salad was excellent and the coleslaw only so so (although it improved significantly after sitting in the fridge overnight), but I’m open to other suggestions for good salads to go with cashew chicken. 4) READ BOTH STEP 4 & STEP 5 NOW. When the chicken is done marinating, heat a large skillet to medium high, and use tongs or a slotted spoon to transfer the chicken pieces to the skillet. Sauté until the chicken is cooked through. Save the remaining marinade for a little later. 5) At this point the original recipe suggests setting aside the cooked chicken, sautéing the onions in the leftover sauce, and then mixing the chicken back in. I mindless followed these instructions both times I’ve made the dish, but upon further reflection, I see no clear reason why – I have a very large skillet, and to save some time and dishes, I’ll just cook the chicken and onions simultaneously next time. 6) When the chicken and onions are just about done, mix in the cashews, and pour the remaining marinade into the skillet. Simmer for another few minutes to kill any bacteria in the marinade. 7) Serve over the cooked rice, and sprinkled with the diced chives or green onions. I first left the chicken to marinate overnight because I wanted to save some time the next evening. If you’re on a tight schedule and want to prepare as much as possible ahead of time, I would mix together the marinade ingredients the previous day, and also cube the chicken ahead of time. That way you can just dump the chicken into the marinade bag as soon as you get home, and then let it sit while you cook the rice, dice the onions, and make a salad.